The Leinster head coach was displeased with the refereeing of the breakdown and the scrum. Munster greet a penalty decision with pleasure. LEINSTER COACH MATT O’Connor was unhappy with the performance of referee Ian Davies and his assistants during his side’s 34-23 defeat to Munster in Dublin. While admitting that Leinster had been “soft” in defence in the first half, O’Connor bemoaned the fact that Davies only sin-binned Munster players at a stage of the game where the damage had already been done. The Australian head coach was particularly aggrieved with Munster’s tactics around the breakdown and what he saw as a slowing of Leinster possession. Four yellow cards wasn’t sufficient punishment for Munster? 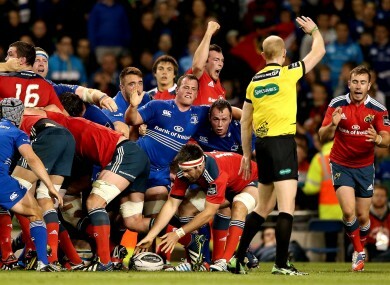 The scrum saw Leinster win two penalties in the early stages, but Munster regathered and managed to gain momentum in that area as the game developed. Again, O’Connor felt the refereeing of that aspect of the game was not up to scratch. O’Connor’s criticism of the match officials, of course, directs attention away from his own team’s shortcomings. Munster were dominant physically for large portions of the game, even though Leinster did claw their way back from a large deficit in the final quarter. The Leinster head coach said that mini-resurgence simply wasn’t enough. Email “Matt O'Connor - 'You need strong officials and I don't think we had that tonight'”. Feedback on “Matt O'Connor - 'You need strong officials and I don't think we had that tonight'”.